A work of art you need to hear to believe. You’re enjoying a wonderful, crisp autumn afternoon in Terwillegar Park with a very special someone. As you both watch your labradoodle joyously run through the tall grass of the off-leash area, you catch up. Quietly, you discuss politics, your work weeks, maybe how oddly that guy over there is dressed. Is there someone with an ear to a stone-and-steel sculpture in the park? If the answer is yes, then that person can likely hear every word you’re saying. That’s because the three sculptures that make up Royden Mills’s Resonant Progression series are more than mere art. They’re sonic amplifiers and projectors. They’re not meant simply to be looked at; the twisted steel has a purpose – Mills’s intent is for the visitor to interact with the art. The sculptures are so much, well, fun, that Americans for the Arts – a non-profit aimed at promoting the arts on the continent – recognized Mills’s series as one of the best examples of public art that was unveiled in North America in 2017. So, how does it work? 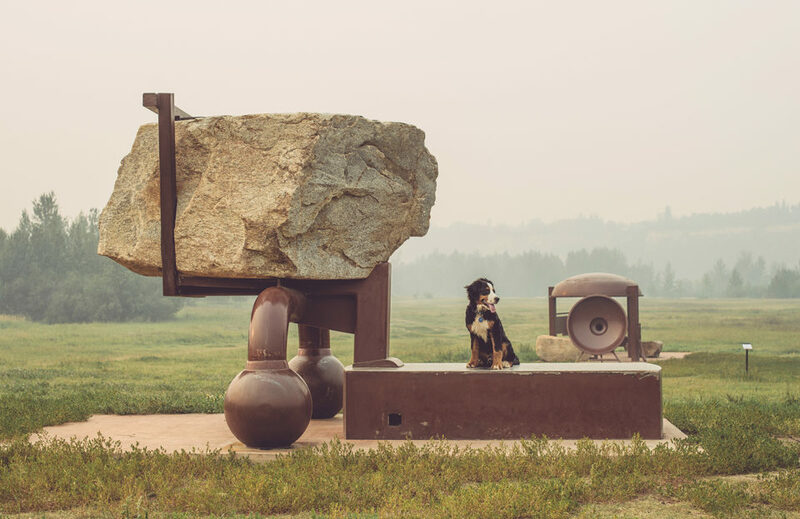 Walk in from the parking lot, and you’ll see the first piece, “Potential” – a large cube of Edmonton granite sitting atop what looks like a large metal kettle bell. Just a few yards away is “Resonant Point,” what sort of looks like a giant Alexander Graham Bell-era telephone. The giant bell connects to a tube; put your ear to it and, voila, the conversations and birdsong and dog barks from yards and yards away now sound like they’re being uttered right next to you. You’ll hear the gentle changes in the wind, like Superman. Walk across the meadow to the riverbank and you’ll find “Beyond Listening,” which looks like a twisted trumpet laid across granite. The granite matches the cliff faces from the river valley. Again, put your ear to the tube and hear the wind whistle and the rush of the North Saskatchewan. Mills, the former president of the Edmonton Contemporary Artists Society, comes from an architectural background. He spent time honing his artistics skills in Japan before returning to Edmonton.